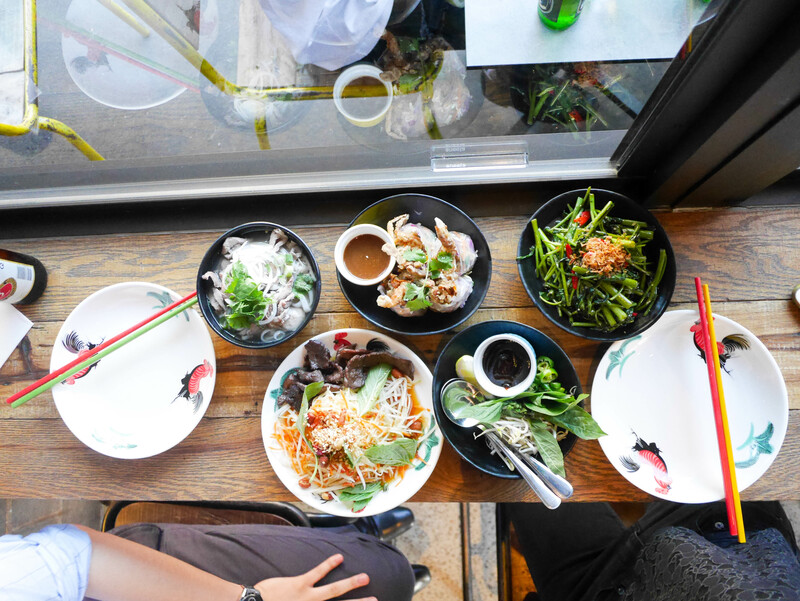 I’m told a good Vietnamese meal is scarce to non-existent beyond the realms of Cabramatta. While that statement might be true, this doesn’t deter me from finding as good as it gets in the CBD and inner suburbs. 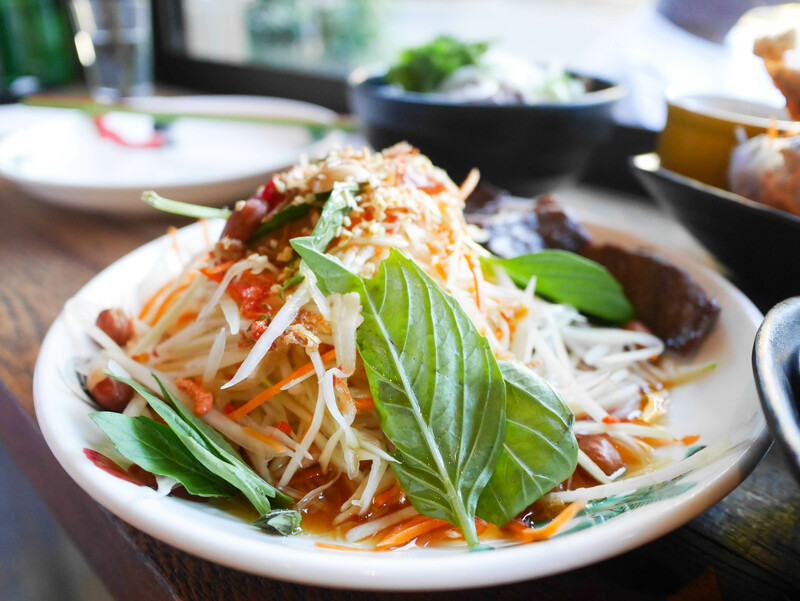 I hazard to say that Vietnamese food is reasonably ‘healthy’ as well so even if I’m not getting the greatest Viet feed ever, I can at least walk into a Viet restaurant knowing there is some kind of salad thing on offer. Mama’s Buoi is another Misschu, another Madame Nhu and another Great Aunty Three. 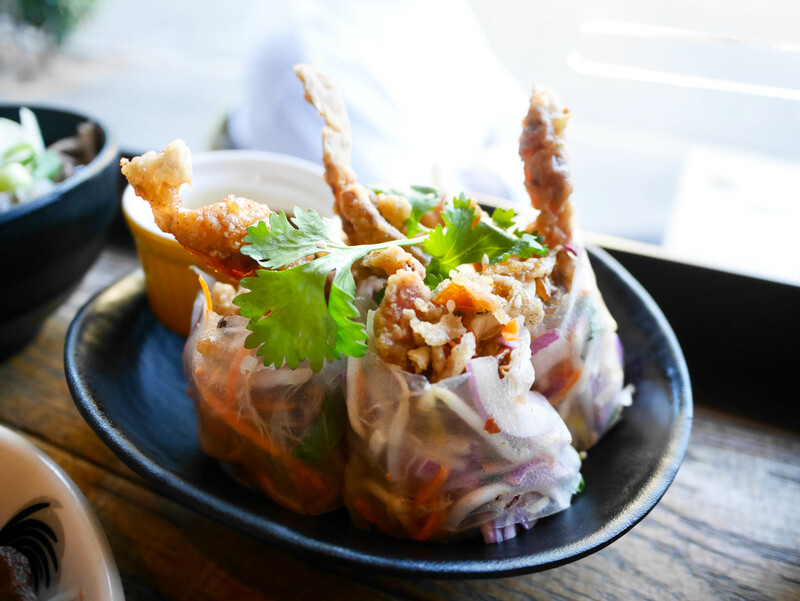 It’s another attempt to make Vietnamese cuisine accessible to multicultural Sydney with a nice fit out and extensive alcoholic drinks menu. It’s a restaurant tailored to fit you the way your T.M. Lewin suit was tailored to fit your Big Four job that you caught an Uber from to get to this Surry Hills location. To be clear, I’m not making fun of this joint. A restaurant’s success is dependent on forming a connection between its food and its customers. I don’t have a problem with creating shortcuts to make such a relationship work. Dressing up the look and feel a venue is simply that extra spritz of cologne you wear on that first date. In fact it’s a good business decision and nothing turns me on more than the whole package. As long as your food matches the romanticised family background story on page 2 of the menu, I’m a happy clam. Papaya salads taste more like summer to me than any coconut. It’s a texture playground where shredded papaya and carrot are see-sawing with peanuts, sesame seeds and basil. Mama’s Buoi’s rings a tad too sweet on my tastebuds as I usually prefer it sour and spicy the way the Thai’s do their som tum. They also weren’t kidding when they said ‘dried beef’, it was getting to the texture of jerky. I still quite liked it for the flavour but the beef was mostly left behind by us. On that particular week I had a hat trick of morning glory meals. 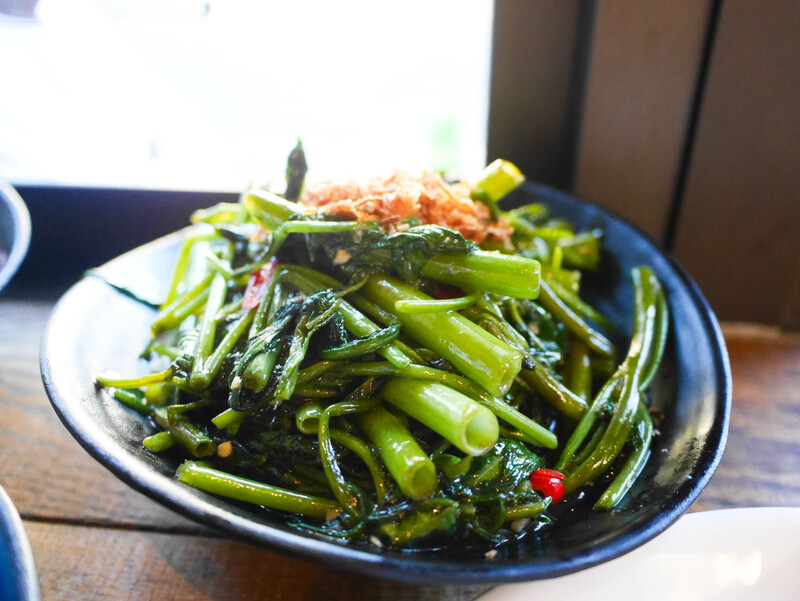 Also known as ‘kangkung’ in Malaysia and Indonesia this is one of my favourite, favourite, favourite vegetables especially when it comes with chilli. This came as a side-sized portion hence the low price of $8 but I would’ve gladly had this as a main dish. The great thing about well-cooked morning glory is you get a real crunch from the stem bits while the leafy components practically melt on your tongue. I don’t know what is it about morning glory but I find that it absorbs flavour a lot better than most Asian greens as well. It really is nevermind that I can make this myself at home for $2, kangkung is life. Cue kangkung song. I really loved that this was all veggies and filling and none of the rice noodles. I think if you have enough variety of green, you don’t need the texture of the noodles (there’s no flavour to them anyway so that’s all they provide). While this was quite nice, Jeff and I questioned afterwards our choice in filling since this was kind of like a sushi but not. I’m not an expert in pho. As long as the soup is reasonably clear and doesn’t look like muddy drain water post-Sydney storm, I’m good. 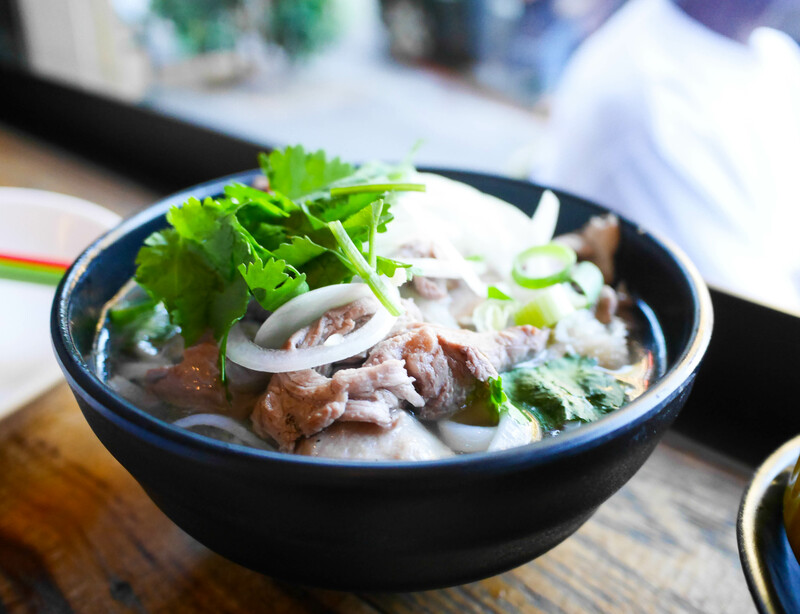 This Mama’s Buoi signature lives up to its reputation of a good broth and wholesome ingredients. No dried beef in this bowl that’s for sure. Again, always a fan of half sizes because they allow you more flexibility with ordering. 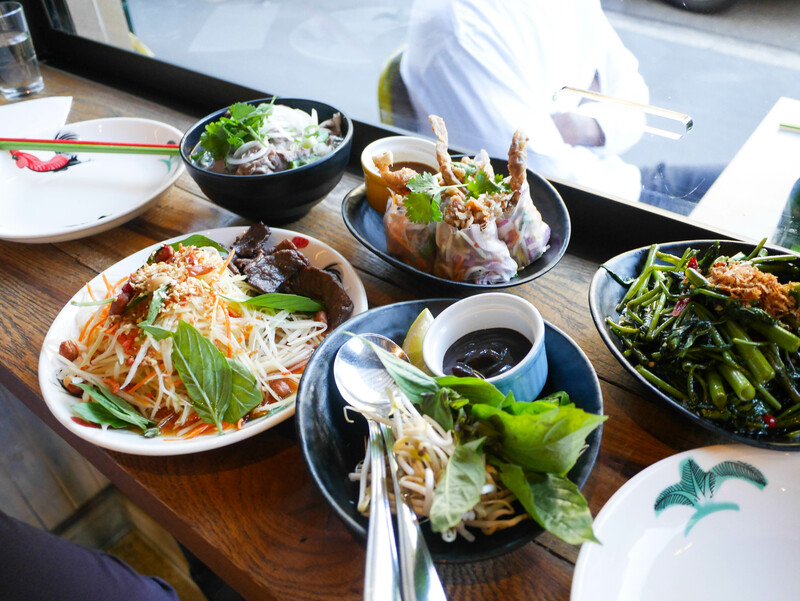 Particularly with Vietnamese food, it would be quite hard to get a huge bowl of pho and to still have room for other things. Reading back on my introduction, it’s probably a lot easier for me to say those things because I am not of Vietnamese descent. I am far less forgiving when people romanticise and bastardise Malaysian food then slap on a two-digit price for a piece of roti. But at the end of the day, eating out is about individual satisfaction so eat what you want at whatever price you deem reasonable and be happy. If you count the pennies up on this post, it’s a seriously great price to pay for a CBD located meal that’s just quite nice even if it doesn’t taste fresh of the boat.